Quality makes the subtle difference. High quality materials make a sustainable contribution to well-being and to the longevity of the shoe–one good reason why we only work with selected partners, who make these materials available to us for the production of our products. We work with leather and high-tech materials, which satisfy the maximum demands. Animal hide is a material that is produced 100% naturally. Its properties determine the quality of the leather it produces. Significant variations in quality can arise even with the same leather. Special processes during tanning and finishing can further improve positive production characteristics. Leather is characterised by its good breathability, longevity, stability of form and simultaneous flexibility. All substances used in the production of our leather are subject to strict legal specifications, and in some cases lie well below these. Your health and well-being are very important to us. We therefore only use leather from manufacturers who fulfil these requirements. kind to skin. 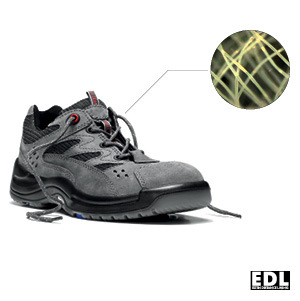 In many workplaces, metal-free safety shoes are essential. And those allergic to leather also play it safe when opting for a pure textile product. They offer greater scope than leather, because they are much more versatile in terms of structure and surface configuration. ELTEN therefore utilises high-tech materials from leading international manufacturers. We work together with the leather tannery Heinen in Germany. Here, top quality leather is produced according to the highest social and ecological standards. 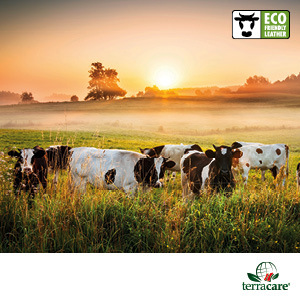 By purchasing safety shoes produced from Terracare® leather, you actively support the reduction of CO2-emissions. 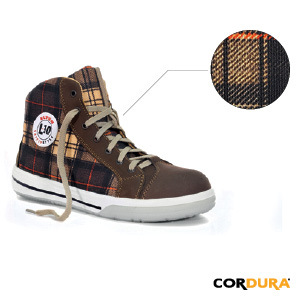 Cordura® is a high-quality fabric woven with polyamide fibers. This material is very light and breathable. Thanks to its extreme tear and abrasion resistance, Cordura® is very suitable to be an upper material. In addition, it is dirt- and water-resistant and dries quickly. 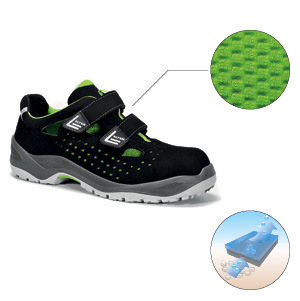 Shoes with a GORE-TEX membrane permanently protect your feet against moisture, are extremely breathable and provide optimale climate comfort control. 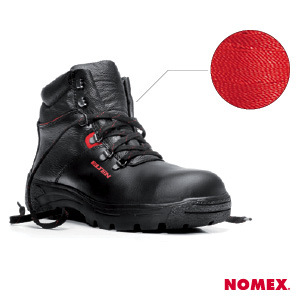 Shoes with GORE-TEX Performance Comfort are especially suitable for working outdoors in normal to cold temperatures thanks to a low insulation. Shoes made with GORE-TEX Insulated Comfort are particularly good for use in rain, snow and cold temperatures. With maximal heat insulation the foot will remain warm. NOMEX® by DuPont™ is a high-strength fibre made of a patented mix of 95% NOMEX® and 5% KEVLAR®, high-strength aramid. NOMEX® offers optimum flame resistance, heat protection and chemical resistance. It is selfextinguishing, will not melt nor drip, its fire resistance is not affected by cleaning. 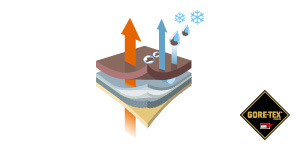 We use high-quality textiles with exceptional characteristics when it comes to moisture absorption and release. Our inner linings are skin-friendly and achieve a long service life. Optimal absorption and release of moisture by way of a breathable lining. The microfibre spacer fabric effects a capillary action for significantly better moisture transport. The 3D structure is thermo insulating and the pump effect ensures high air permeability and breathability.